The three-hour drive to Aunt Mable's house during the holiday season is fraught with much less risk today than it was twenty years ago. Thanks to advances in automobile diagnostic technology, car trouble is often sensed early and precisely. While they aren't a welcome sight, the various dashboard vehicle warning lights such as the transmission temperature and the tire pressure monitoring system provide a clear indication of exactly what is wrong. When our business is not performing well, it's challenging to determine the exact cause because of the complex ecosystem in which it resides. Are declining sales due to customer consolidation, a new approach to contracting by a competitor, market saturation, poor customer service, lack of innovation or any of a dozen other causes? If your business is not performing up to its potential, a fair starting point is to take a look at your strategy. Since the No. 1 cause of business failure is bad strategy, it's important to understand if your strategy is working or if the malfunction indicator light is on. While a physical light may not appear, you can use the following three "Strategy Warning Lights" to determine if a broken strategy is the cause of your business's underperformance. 1. Goals are not achieved. Goals are what you are trying to achieve and strategy is how to achieve them. It stands to reason that if you're not successful in achieving what you want, it's highly likely the how is not working. The funny thing is, it's common for teams that aren't achieving their goals to blame the goals, not the strategy. The refrain, "The goals must be too high," is much more frequent than, "Maybe we didn't get the strategy right." After identifying your top 3-5 goals, it's critical to hone in on the objectives that quantify them and include a time frame for attainment. The objectives serve as milestones to gauge progress and provide an indicator of the traction power the strategy is gaining. Based on your assessment of the time frame for goal attainment, strategy can then be evaluated at the appropriate points. Green light: Ensure that your team is working off a one- or two-page strategic action plan that is easily updated to remain relevant. If your goals, objectives, strategies and tactics are buried in a 75 slide PowerPoint deck or a 15 tab Excel spreadsheet, it's highly unlikely you'll identify a broken strategy in time to course correct before the damage is done. 2. Lack of profitable growth. While the ability to make more money than you spend is perhaps the most fundamental principle of business, it's amazing how often it's ignored in rationalizing a company or product's performance. Sometimes it's explained as a "loss leader" approach designed to bring customers in to trade-up to more profitable offerings. However, a quick peak behind the strategy curtain can expose the fact that it's not making money for itself or for the business overall, but no one has had the guts to pull the plug. Research by Professor Richard Rumelt of the UCLA Anderson School of Management showed that approximately half of a business unit's profitability is explained by their strategy. If your business is not making money, there's a strong chance a broken strategy is to blame. One exception would be when a firm is investing in a new core competency or enhanced set of capabilities to expand their presence into other future profit pools. Amazon is an example of a company that has made these type of long-term strategic investments, while understanding the trade-off of hindering short-term profits at predetermined points. Green light: An effective exercise to explore your profitability is to assess your value chain. The value chain is made up of the key activities that take your offering from conception to market. Value chain activities may include, R&D, design, marketing, distribution, sales, etc. It's a highly effective tool for breaking your company down into the strategically relevant activities and then comparing those activities from a price and cost perspective to determine exactly where you're making and losing money relative to the competition. 3. Competitive disadvantage. When I facilitate strategic thinking and planning sessions, one of the key inflection points is when a leadership team realizes they are at a competitive disadvantage. From there, the conversation can move in one of two directions: 1) denial and blame or 2) accountability and commitment to battle. The beauty of strategic thinking is that with the proper mindset and judo strategies, you can transform your competitor's strengths into weaknesses and your disadvantage into advantage. Competitive advantage can be defined as the ability to deliver superior value based on differentiation rooted in capabilities (resources and activities). Unfortunately, only 53 percent of managers characterize their companies' strategies as emphasizing the development of relative advantage over competitors; the remainder say their strategies are simply matching industry best practices and delivering on operational antes. Consider your strategies: do they create differentiated value and competitive advantage or are they basically the same thing everyone else is doing? Green light: One of the most productive exercises in my strategy workshops is when we do a deep dive on the competitor's strategic approach to the business. While your people are intimately familiar with the competitions' product specs, how well do they really understand your competitors' strategies? By taking a granular look at your competitors' core competencies, capabilities, messaging, etc., you can clearly identify the root of your competitive advantage or disadvantage and change your resource allocation accordingly. Is your strategy broken? If you're not hitting your targets, not making money or getting beat by your competitors, the answer is yes. 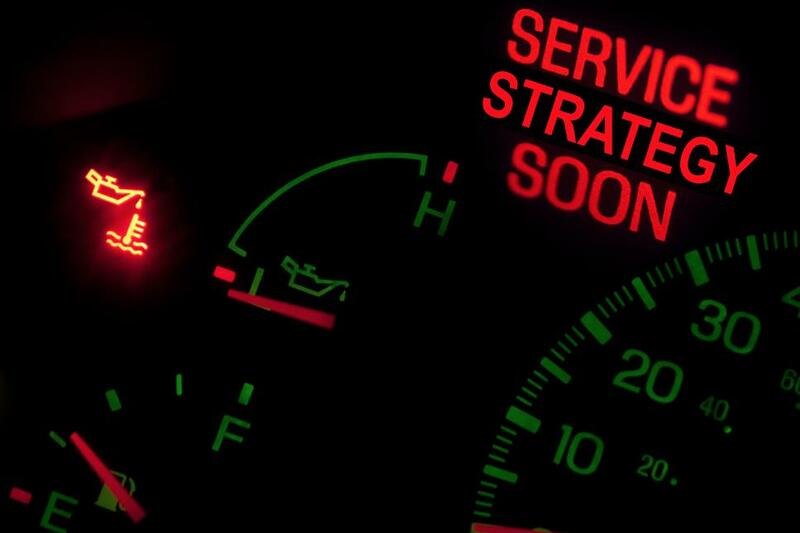 Watch for these strategy warning lights and use these strategic thinking exercises to change lanes. Fixing a malfunctioning strategy begins with the willingness to think differently and results in the ability to outperform competitors in delivering value to customers. Pass or get passed. Rich is the founder and CEO of the Strategic Thinking Institute, and has helped more than 50,000 managers around the world to develop their strategic thinking capabilities. A former Chief Strategy Officer and professor of strategy, he brings both real-world experience and practical expertise to help groups build their strategy skills. Rich is a New York Times, Wall Street Journal and USA Today best-selling author on strategy and has appeared on ABC, NBC and FOX TV. Sign-up to receive your free copy of Strategic Thinker by visiting www.strategyskills.com.